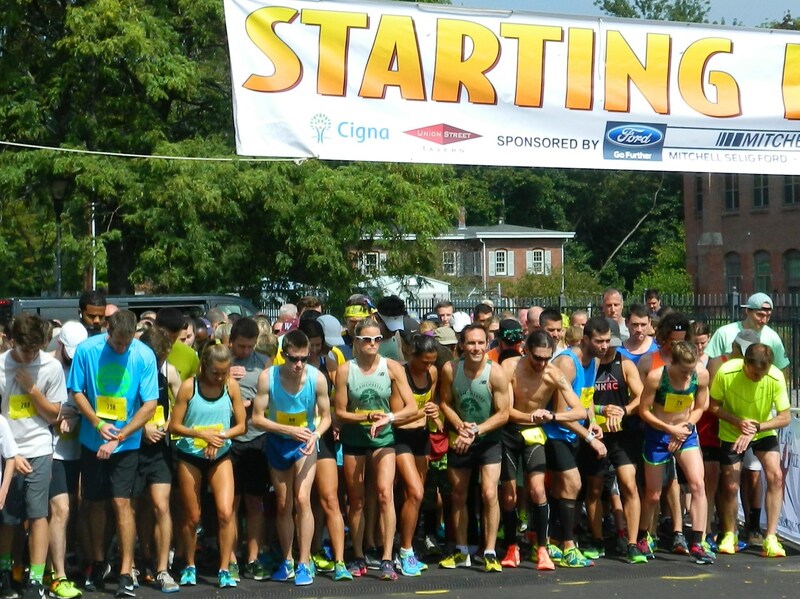 Honoring America during the national anthem before the race got underway. Hailey Pinard 2017 Hometown Hero and Morgan Platt 2017 “In the Spirit of Alex Scott” award. 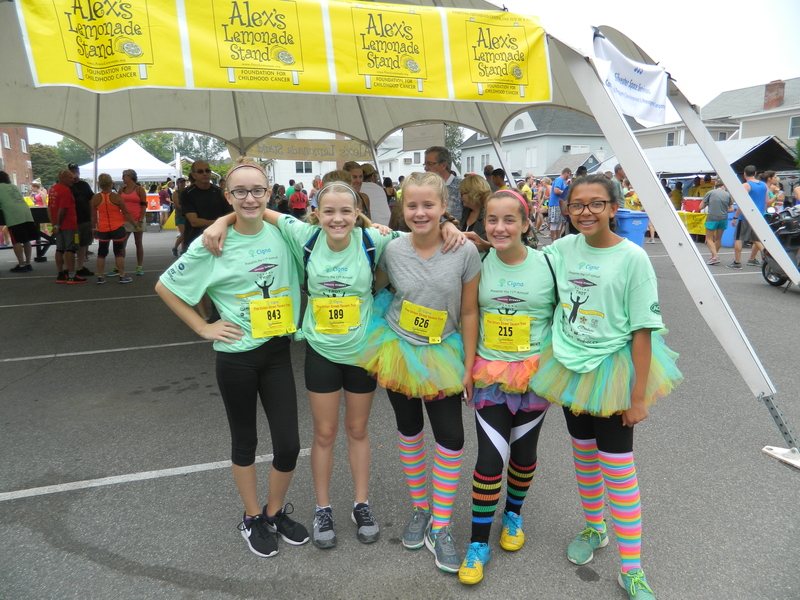 The 11th Annual Tavern Trot raised another $65,000 for Alex’s Lemonade Stand Foundation, which is dedicated to pediatric cancer research. 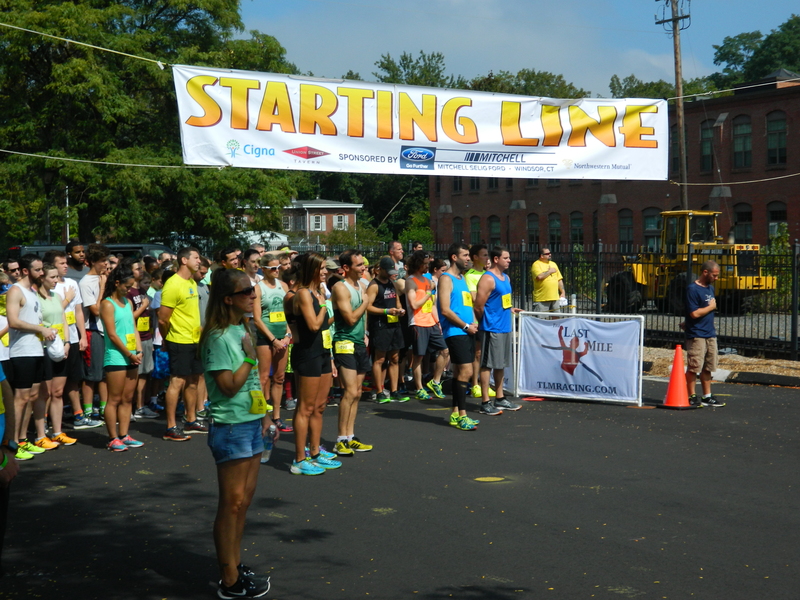 Hosted by the Union Street Tavern the event was held September 17 in Windsor, Connecticut under sunny skies with temperatures reaching the low 80 degrees. 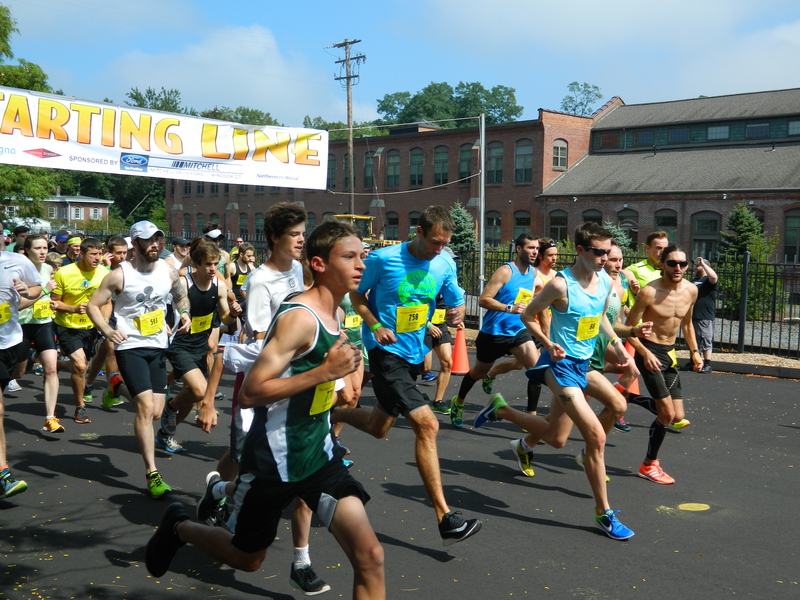 Attracting 950 participants, a number up from 300 in year one, over eleven years the Tavern Trot has raised $300,000 for Alex’s Lemonade Stand Foundation, according to Mike Deneen, part owner of the Union Street Tavern. 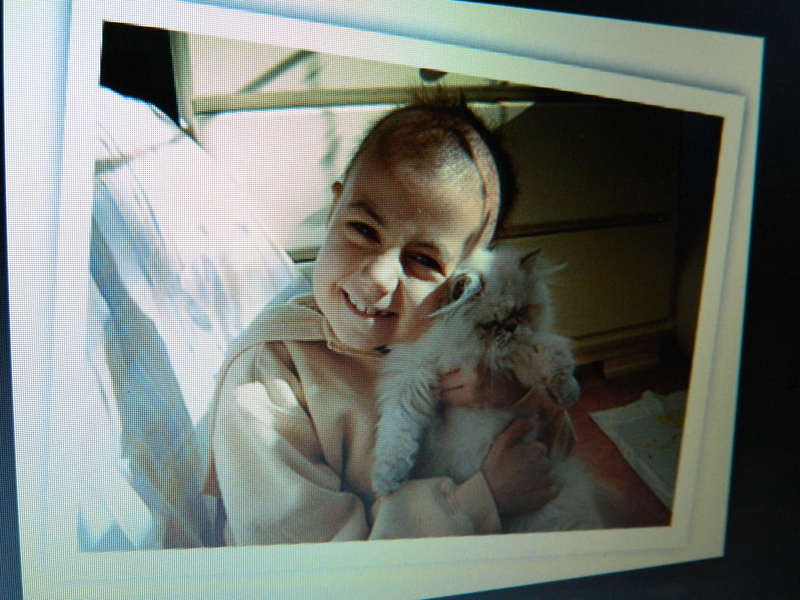 That amount is part of $150 million the non-profit organization has raised for the cause since its inception, inspired by Alexandra Flynn Scott (1996-2004) who at age four while fighting neuroblastoma set up a lemonade stand outside her Connecticut home to raise money to help others with childhood cancer. Accepting the check for $65,000 for Alex’s Lemonade Stand Foundation are Liz Scott, Alex’s mother, and Chris Pinard, father of Hailey who continues her battle with neuroblastoma. 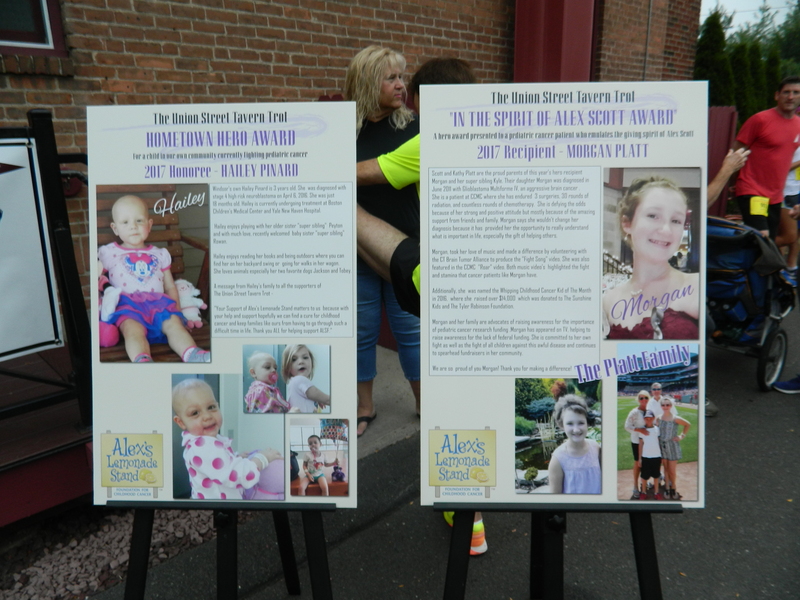 “It’s really meaningful to see how it (Tavern Trot) has grown,” said Liz Scott, the mother of Alexandra Flynn Scott “Alex”. Morgan Platt and her family of Avon, CT attended. 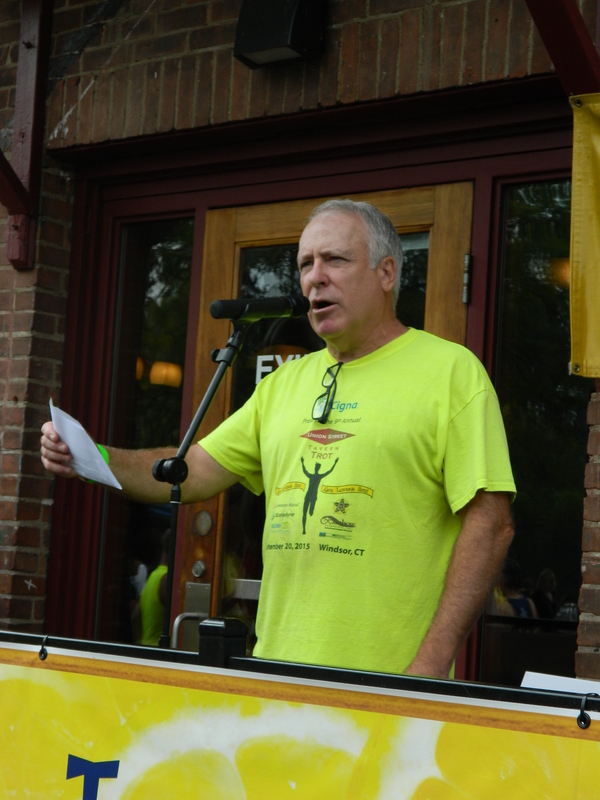 Mike Deneen, part owner of Union Street Tavern, addresses the crowd. “Alex was the spark but so many have kept it going,” she added. Among those in attendance were Chris Pinard, a Windsor volunteer firefighter who has also served in the Connecticut National Guard. Pinard’s daughter Hailey is battling neuroblastoma. 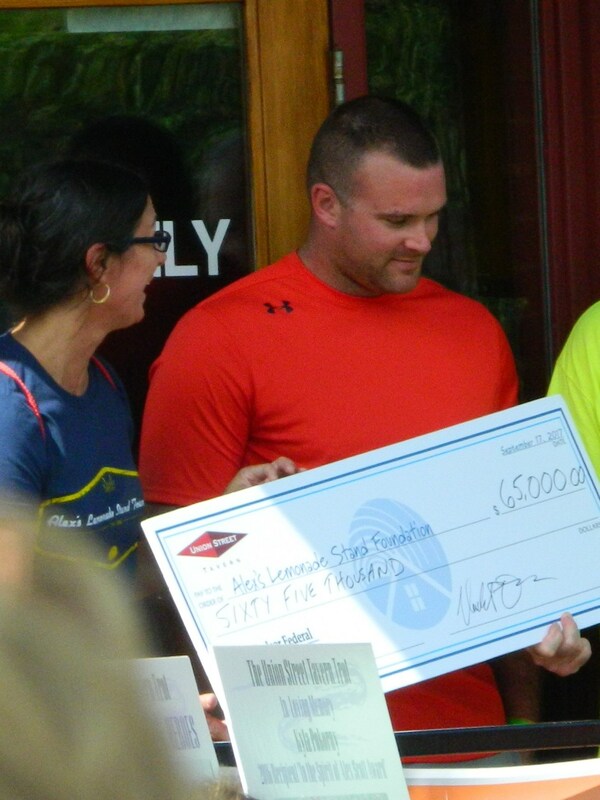 He helped Liz Scott, who was originally from Windsor, accept the check for ALSF. 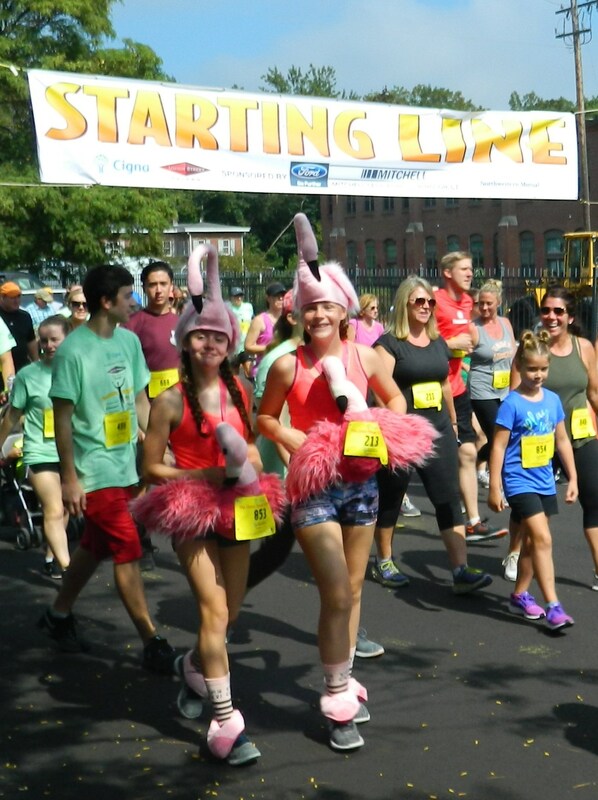 Hailey Pinard was selected as the 2017 Tavern Trot “Hometown Hero.” In 2011, Morgan Platt of Avon was diagnosed with a brain tumor. 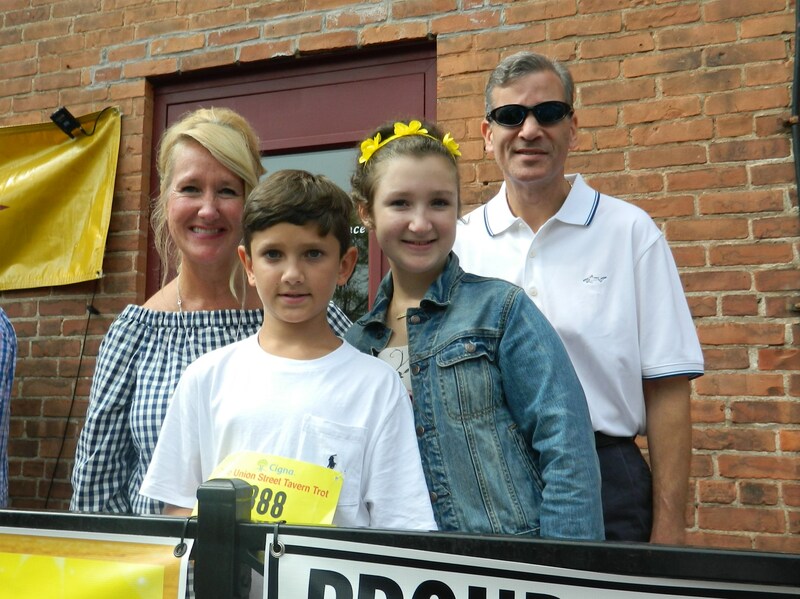 She was chosen the 2017 Tavern Trot recipient of the “In the Spirit of Alex Scott” award and was joined by her family at the event. 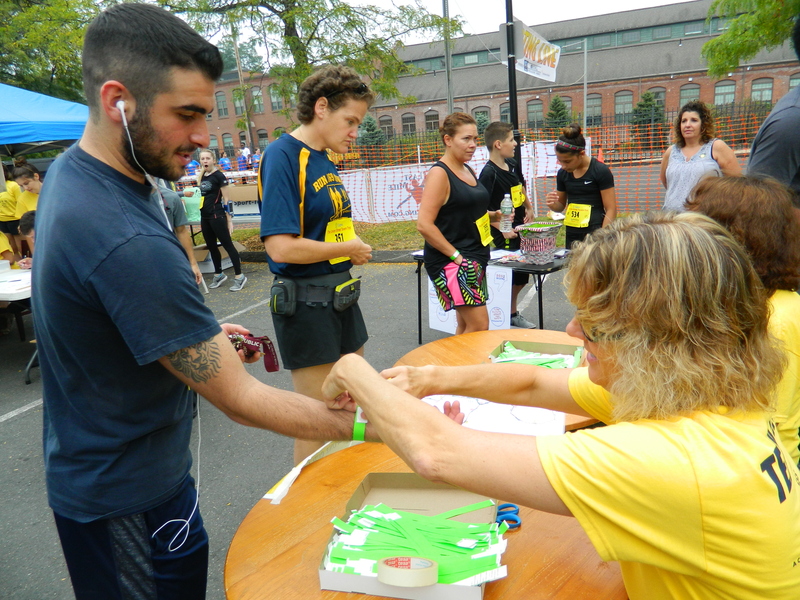 Jenn Bernstein and Lorenzo Hall of FOX 61 served as emcees then later took part in the road race. 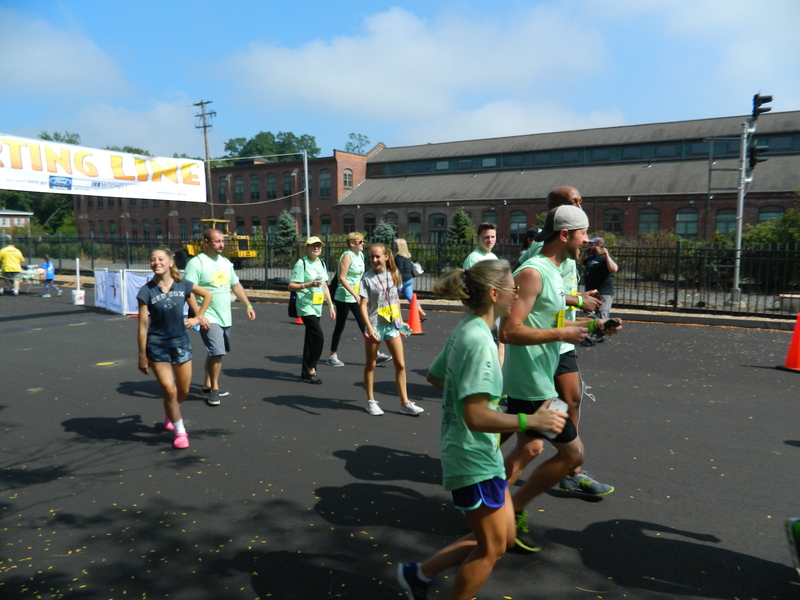 In addressing the crowd, Morgan’s mother Kathy Platt praised Alex’s Lemonade Stand Foundation for not forgetting the sometimes overlooked siblings of childhood cancer patients. “The have a program for siblings,” she noted. Platt added there is light ahead, a hope for a cure. 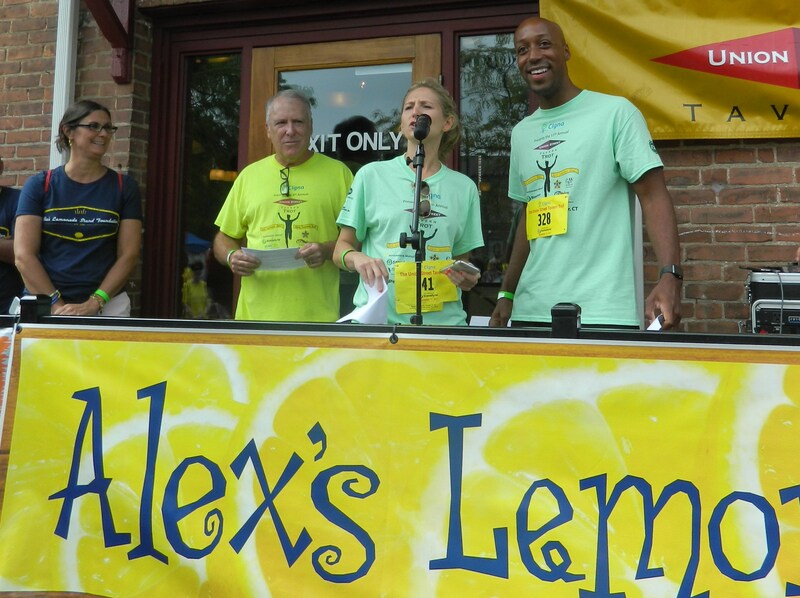 Jenn Bernstein and Lorenzo Hall of Fox 61 served as emcees and later joined in the road race. Rich Poirer tries out some stretchng offered by Perry Siegel of Select Physical Therapy before the race. 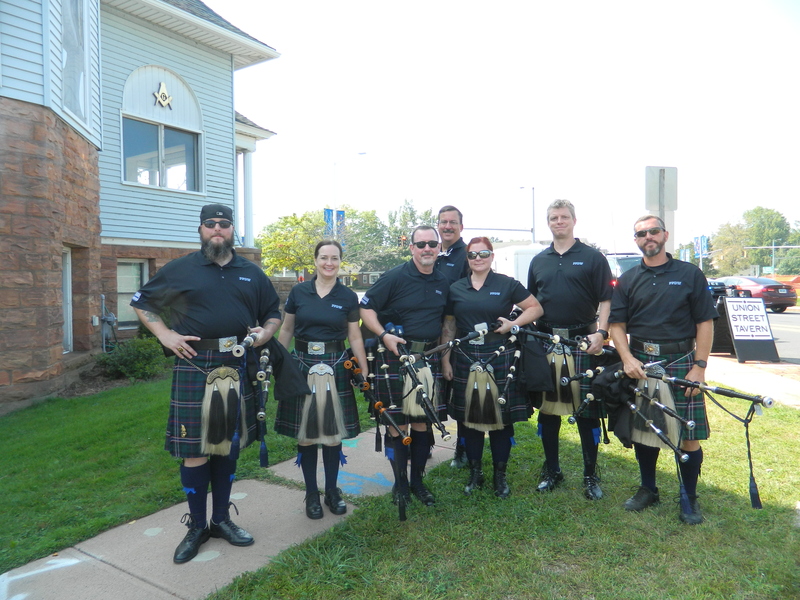 Police Pipes & Drums of Waterbury turned out to provide musical encouragement to the runners. 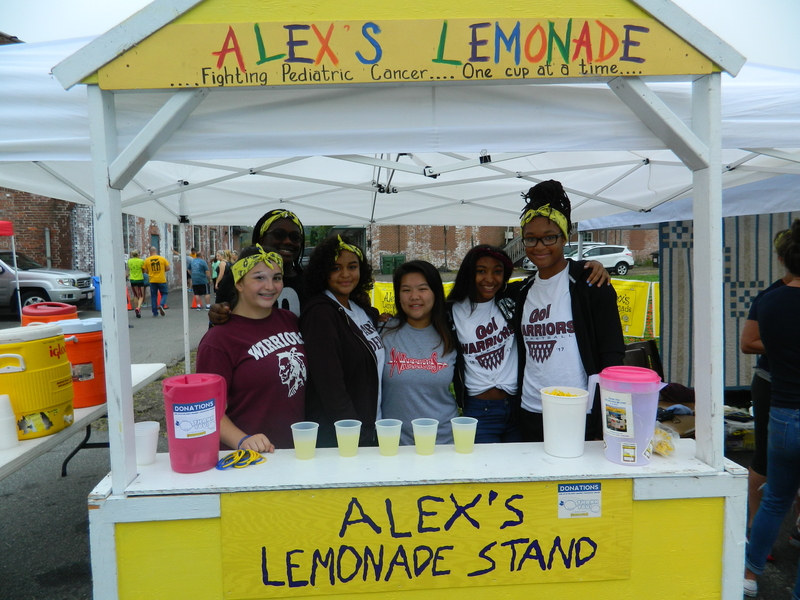 Windsor High School students volunteered at the Alex’s Lemonade Stand booth. Justin Cusker recieves his registration bracelet. 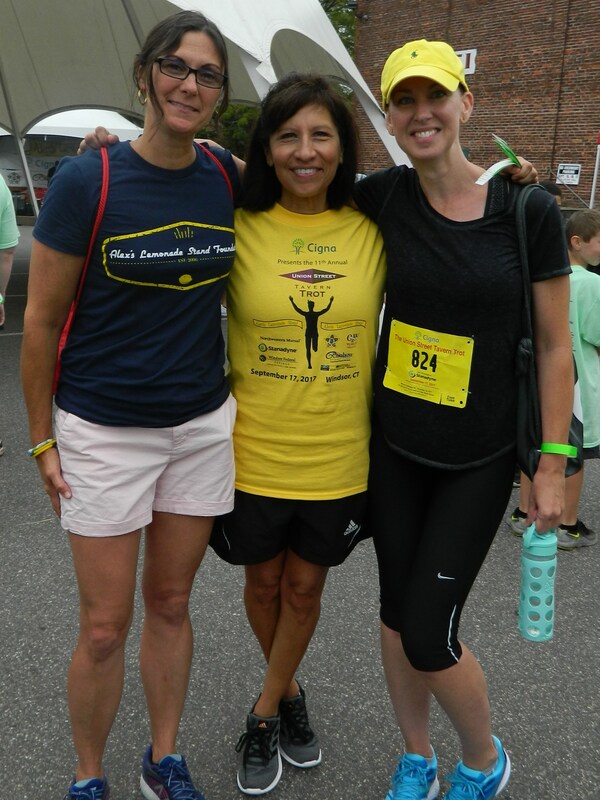 Liz Scott, Suzanne Schumann and Pam Howard.